A simulated picture of two merging black holes, each about 30 solar masses. This is approximately what a human would see if they could travel in spaceship to take a closer look at merging black holes. 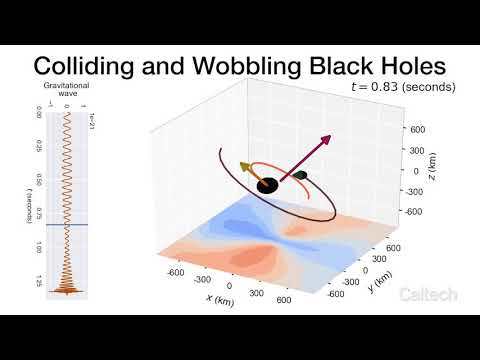 Credit: SXS, the Simulating eXtreme Spacetimes (SXS) project (http://www.black-holes.org) This simulation shows the merging of a 20 solar-mass black hole with a 40 solar-mass black hole. A new model now predicts the end state of a merger with the greatest accuracy yet, including the final black hole's spin, mass, and recoil velocity, or "kick." The black holes' spins are indicated with arrows—because they differ from the orbital angular momentum (pink arrow), the orbit wobbles, or precesses. The blue and red orbs indicate patterns of gravitational waves generated in the collision.